MANCHESTER, N.H. — Democratic presidential candidate Sen. Bernie Sanders of Vermont and front-runner Hillary Clinton enter Saturday night’s New Hampshire debate with tensions still raw after a few of Sanders’ staffers extracted some of Clinton’s voter data. “I’m sure it will come up early on and both will take a tough stand,” said Marist College pollster and professor Lee Miringoff. Earlier Saturday, the Democratic National Committee sought to diffuse the conflict after some of Sanders’ staffers took advantage of an opening Friday when the firewall separating voter data at an Internet site temporarily collapsed. The Clinton campaign accused the Sanders campaign of stealing critical voter information, and wants to make sure none of the data was copied. The Sanders campaign accused the Democratic National Committee of aiding the Clinton campaign when it put a freeze on Sanders’ campaign using even its own data from the Internet site while the committee investigated. That could have kept Sanders’ campaign from accessing the important data into the New Hampshire primary and Iowa caucus. Instead, Sanders took his own party to court, prompting a settlement Saturday morning. The issue threatened to tarnish the campaign of Sanders — who has tried to represent a departure from traditional, cutthroat “rigged” politics — and Clinton, who is trying to appeal to party unity. How long the tension will last, however, is uncertain. 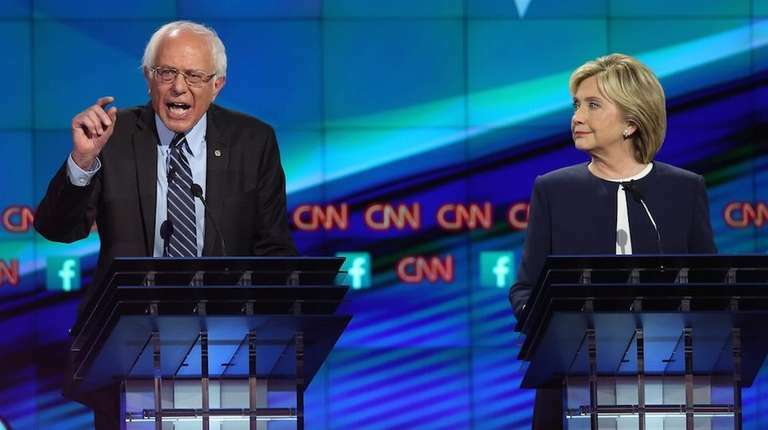 The Democrats have spent much of the first two debates contrasting their collegial encounters with the sometimes raucous debates of the Republican candidates for president. Miringoff had said former Maryland Gov. Martin O’Malley needed such a conflict between Clinton and Sanders to gain some attention at the debate. Miringoff said voters need to see negatives in Sanders and Clinton in order for him to get traction from his single-digit showings in the pols. But Miringoff said Saturday: “This is probably not large enough for O’Malley to kick open the door,” Miringoff said before the nationally televised debate.